The world is in thirst of peace.Bomb blasts everywhere around the world making our lives unsecured one.As this is going on, an heartbreaking incident happened in Guatemala.The most popular country of riots.The famous country for riots in south America,Guatemala has got another gruesome riot in its prison.According to the reports there was a clash between the two groups in the prison and serious clash broke out between the inmates itself.In this riot 7 prisoners head were been chopped off by the other group and their bodies were burnt.The chopped head were kept on and a prisoner kicked off the head like a ball.The video was taken lively and it was heartbreaking. It is said that Guatemala is the place where most number of riots happen.The prisoners were being mostly convicted in the smuggling and drug handling cases.The way the people involved in this issue was really wild as if they dont have six senses.They are compared to the animals and they dont deserve to be in prison.They should be hanged until death.something has to be done. The prison is to change the mind of the accused ones and to have a disciplined life.But these activities seems that, the prisoners are very liberal inside the prison and the well equipped police personnel could not take action these people. We are humans and not animals.Ecology is a balanced one,and no animal kills it’s race.The humans are the only living being kills their race just for their individual satisfication. The President and the President-elect of United States had a meeting in White House.This is First visit of Obama to White house after being elected as President of United States.Both the greats spoke for 2 hours.Bush assured Obama about his full co-operation in a smooth tranisition and the talks were about the critical economic condition and the security challenges in the nation.Bush already mentioned that the election and the formation of new government could become an advantage for the Extremists and they may involve in the anti social activities.In the meeting Bush was saying all the issues related to Iraq and Afghanistan and also about the economic conditions.Bush also took Obama to the white house office and also to the Lincoln’s Bedroom.When asked about their meeting, it was said that, a friendly meeting. The first lady Laura Bush and Michelle Obama had a walk and went to the President’s Residence.The meeting between Bush and Obama held at oval’s office. Lets Hope that the new President of America brings peace and prosperity for the whole world. Barack Obama was elected the nation’s first black president of United States. Tuesday night in a historic triumph that overcame racial barriers as old as America itself.The 47-year-old Democratic senator from Illinois sealed his victory by defeating Republican Sen. John McCain in a string of wins in hardfought battleground states – Ohio, Florida, Virginia and Iowa. A huge crowd thronged Grant Park in Chicago to cheer his improbable triumph and await his first public speech as president-elect. Democrat Barack Obama, before a record 100,000-plus crowd, rebuked his Republican rival John McCain for saying he shared the same ”philosophy” as unpopular President George W Bush. Just nine days before the presidentialelection, Obama again attempted to shackle McCain to Bush’s unpopular Republican economic legacy and tried to rebut attacks on his own tax policy. Denver police estimated his crowd at well over 100,000, as people stretched as far as the eye could see, breaking Obama’s previous domestic record crowd, also of 100,000, in St. Louis, Missouri earlier this month. 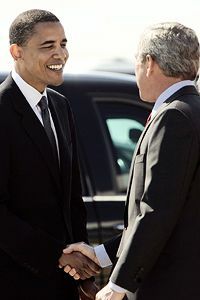 “Just this morning, Senator McCain said that actually he and President Bush ’share a common philosophy,’” Obama said. “That’s right, Colorado. I guess that was John McCain finally giving us a little straight talk, owning up to the fact that he and George Bush actually have a whole lot in common,” Obama said. Obama then listed what he saw as deficiencies of the McCain-Bush philosophy, which encapsulated his main campaign themes heading into the election on November four as America battles its deepest economic crisis since the 1930s. “We can’t have another four years that look like the last eight. It is time for change in Washington,” Obama said. One of China’s most prominent human rights activists, Hu Jia, has won the European Parliament’s prestigious Sakharov Prize for Freedom of Thought.Mr. 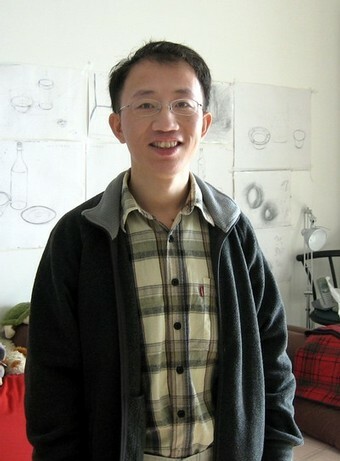 Hu, an advocate for environmental and HIV/AIDS causes, used the Internet to report and distribute information about alleged abuses in China in the lead up to this year’s 2008 Beijing Olympics. In April, the 35-year-old was sentenced to a three and half year prison sentence for “inciting subversion against the state.”Hu did dedicate much of his time to raising awareness of AIDS and environmental issues in China. Hu Jia and 42 Chinese intellectuals signed an open letter entitled “One World, One Dream: Universal Human Rights”, calling for more attention to human rights in China. On 6 September 2007, he and his lawyer, Teng Biao, published another open letter, “The Real China and the Olympics“, detailing the situation of human rights in the run-up to the OlympicsThe Chinese responsed harshly to the announcement of EUas “We express strong dissatisfaction to the decision by the European Parliament to issue such an award to the jailed criminal in China, in disregard of China’s repeated representations,” Foreign Ministry spokesman Liu Jianchao told reporters. “It also violates universally recognized rules in the world, which is countries should treat each others as equals and respect each other.” For all the work he’s done, Hu Jia remains relatively unknown in China today, although he is a favourite posterboy for Chinese dissidents among EU lawmakers because he once addressed the European Parliament via webcam while he was under house arrest. Next week’s EU-China summit in Beijing will be a fun one to watch.